All of the above photos were taken when Silver Sands was experiencing high winds and rough seas. But that did not deter the above guests, who enjoyed bodysurfing and playing in the waves. In December, the sand usually (emphasis on usually) shifts and the Silver Sands Swimming Beach changes from a deep shorter beach to a narrower longer beach. The shifting sand can actually double the length of the beach. In the photo below, the lifeguard is standing on a sandy beach that was not there during the Summer months. This is nature's wonderful way of keeping the Silver Sands Beach and Sea clean and ALIVE! A great beach will have a sea that is alive! It will be one that will change, calm sometimes and even very rough sometimes with chop and waves, just like the Silver Sands Beach, Jamaica. It is alive and even changes in length and depth, depending on the time of the year. The Silver Sands beach gets a good blast of the northeasterly trade winds when they blow, and this produces awesome conditions for bodysurfing and boogie-boarding. This movement of the water cleans things up, depositing new sand on the beach, keeping it crisp underfoot. 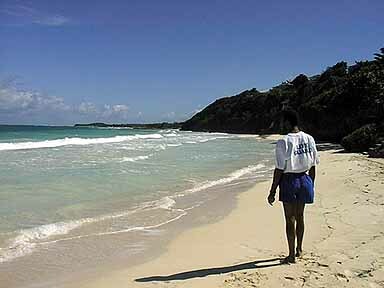 Typically, the Silver Sands beach in Jamaica begins the day calm and flat. But on those days when the trade winds blow, chop will develop as the day progresses. This is the best of both worlds. Of course, clean clear water also means the snorkeling is excellent. Actually, when you are in chest deep water, you can look down and see your toes on the sandy bottom. Enjoy Snorkeling at Silver Sands Jamaica.